The unmistakable sound of the Cuckoo is a sure sign that spring has arrived. 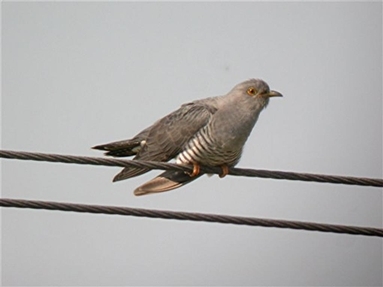 The first Cuckoos are usually heard in mid-April. This year on Arran it was the 18 April. The earliest record on the island was 10 April in 2001. Peak migration takes place in late April/early May. Few people are unfamiliar with the song of the Cuckoo, and I am delighted when people take the time to contact me when they first here the call but beware Collared Doves can imitate Cuckoos very well! Hearing a Cuckoo is one thing getting a good view is another. At first glance, a Cuckoo in flight might be mistaken for a Kestrel; they are long-tailed and long-winged and have a fast flight. If you are lucky enough to get a view of one perched you will see a grey bird about the size of a Collared Dove with a blue grey head, chest, and upper parts; the under parts are white with dark bars; and it has characteristic long, drooping, wings. The females have a slight brown tinge across the breast. More rarely, females occur in a rufous phase. The young are brown barred like these females but with a white spot on the nape. Because full-grown Cuckoos are really difficult to catch and finding nests with young Cuckoos in it is tricky, the number ringed is quite low, so there is not much information based on ringing data as to where Cuckoos go in winter. The only recovery of a bird ringed in Britain as a nestling was in Cameroon in January. The well known feature of Cuckoos is that they lay their eggs in the nests of other species. In Arran they usually target Meadow Pipits and Dunnocks but over 50 species of host have been recorded in Britain. The young Cuckoo is brought up entirely by foster parents. The Cuckoo parents take no part. It is an astonishing piece of evolutionary behaviour but perhaps even more mind boggling is to consider that, once raised, the young cuckoos make their own way to their ancestral wintering grounds in the tropics. No adult guides them. The adults have left weeks before. Not only that, the following spring these young from the previous summer return to northern Europe and are able to recognise and seek out a mate among their own kind. Reflect on that as you listen to the unmistakable sound of the Cuckoo.